I get this error when trying to create a new user, what could be the problem? what server were you using? 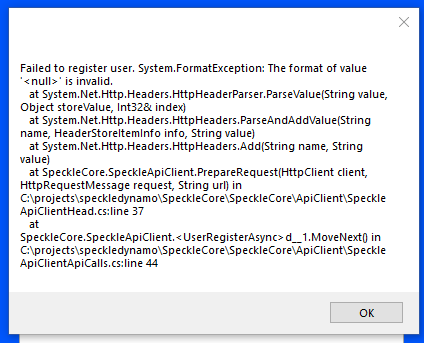 looks like error’s coming from dynamo, correct? if so, or other software, what versions, etc. (inc. revit!)? You can try registering online at https://hestia.speckle.works/#/register. I will try and test the plugins asap too. Thanks! Yay, i can reproduce it - in Rhino too. Something got borked. Flagged it here as critical. Previous release downgraded to pre-release so it doesn’t spread more via auto-updates. To give more information, I also had the problem in both Dynamo and GH. Both using the default server. I couldn’t log in with my old account nor create a new one, similar errors.